Elsewhere in the solar system we finally have Cassini close-ups of the huge Saturn storm (false-color versions here and here): more coverage and amateur pics of Dec. 25, Dec. 24 and Dec. 23; many more great views are here as is the development from Dec. 5...19. • Meanwhile the SEB revival on Jupiter continues, plus a gorgeous rotation video of Sep. 12 (from this material). • Moon & Venus on the morning of Dec. 31 from Germany and India and the constellation on Dec. 29 from Austria. • The complications of solar storm forecasting. • The coma of asteroid Sheila after its weird outburst is still there as pics from Dec. 29 (more) and Dec. 27 show - but short exposures can miss the show! 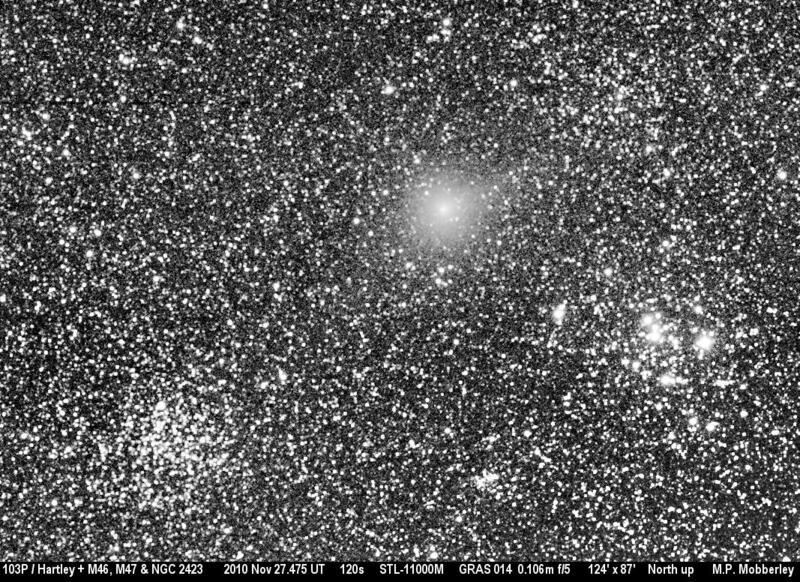 • SOHO has found its 2000th comet (more, more, more, more and mehr). 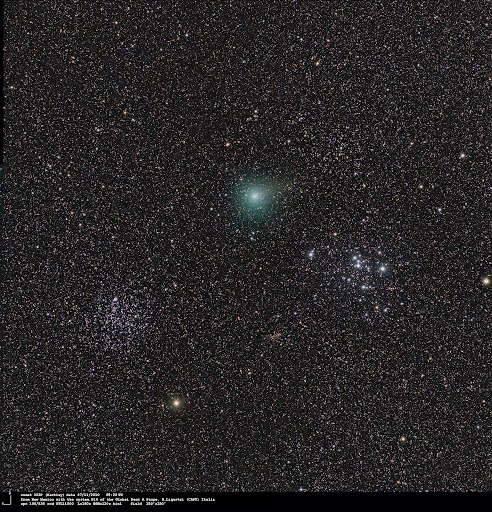 • The orbit (another one) for new comet Elenin may make it bright come next fall. 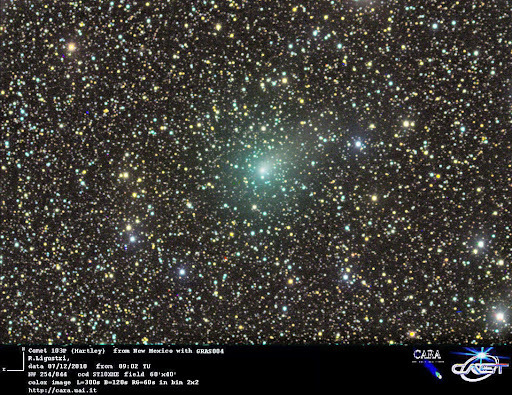 • Comet Hartley 2 on Dec. 29, Dec. 27 and Dec. 26. • Some reports and pictures (including a glorious composite!) from the Geminids. • A subterranean impact crater in New York. • More analysis of the 2008 TC3 meteorites here, here, here and here. • More cool pictures from the Himalayas. • Hi-res views of the ISS in front of the Moon and the Sun. • And finally some freebies: You can have 26 pages of the premiere issue of the new IOTA journal (with lots of stellar occultation conference reports), 155 pages of a kind of textbook on astrophotography and 70 pages of a Minor Planet bulletin as big PDFs, all for free. Happy new year! An asteroid playing comet, fine Geminids and not a "solstice lunar eclipse"
For 104 years the body carring the name (596) Scheila behaved like a perfect main belt asteroid - but now it's suddenly become a weird comet! This short report in German summarizes early developments and links to all that was known at the time, such as this, this and this report. Since then we have more reports from Dec. 18 (more) and Dec. 17, photo collections here, here and here and pictures of Dec. 17 (and 16 and 13; more), Dec. 16 (more), Dec. 15 (more) and Dec. 13 - it looks like the coma is fading already. 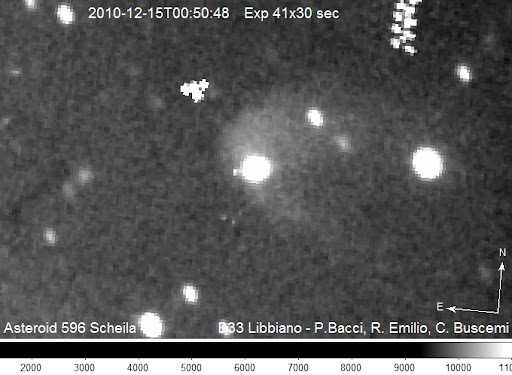 • A new 'Russian' comet, C/2010 X1 (Elenin): a TV report and a Dec. 11 image. 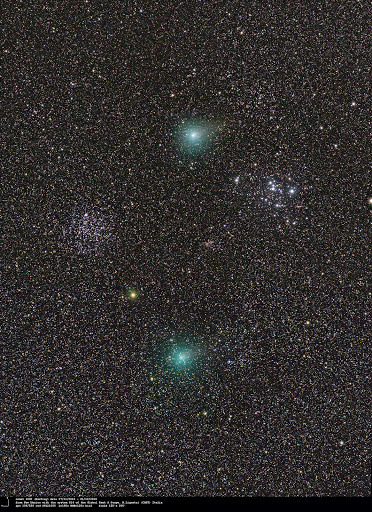 • Other recent comet pictures: 204P and 43P (both with nice tails), P/2010 V1 (earlier; not that impressive) - and Hartley 2, still a green blob amonst a lot of deep sky objects. • Organic material in the meteorites from asteroid 2010 TC3 (more and more) and 2004's comet Machholz (mehr). 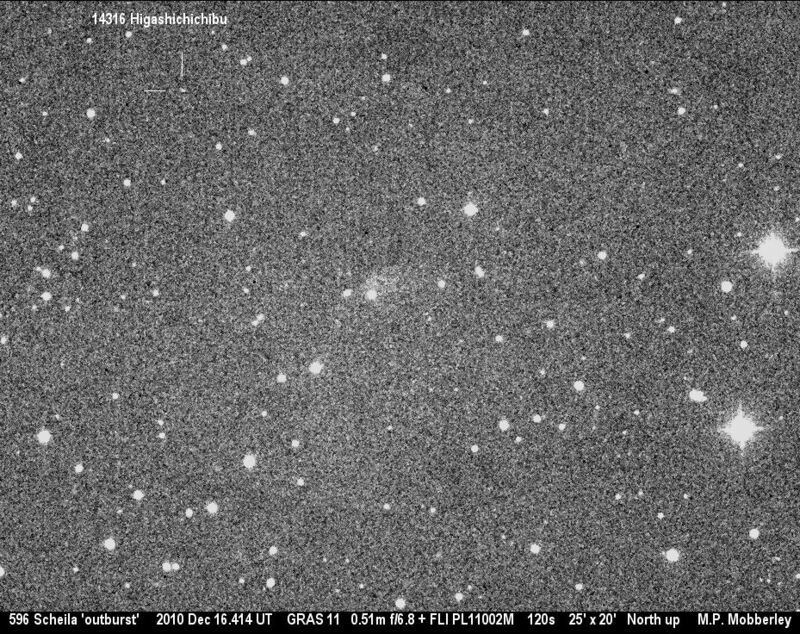 The Geminids of 2010 have peaked on Dec. 14 with a ZHR a bit above 100 (just as predicted): pictures, collections and videos here, here, here, here, here, here, here, here and here. • More about that British bolide thing (with a little dashboard-cam video). • Contrary to numerous stories, the Dec. 21 total lunar eclipse (more, more, more, more) does not happen on the same (calendar) day in general as the solstice which occurs some 15 hours later: From this immediately follows that both events happen on subsequent days for 2/3 of the planet, e.g. most of Europe but also Hawaii. 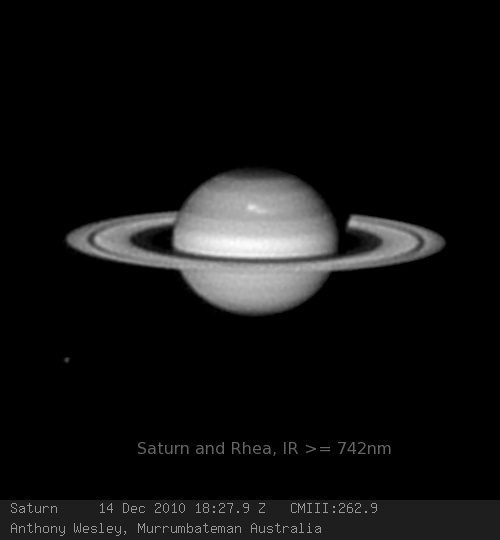 • Further images of the big white storm on Saturn of Dec. 14 and Dec. 13 (more) and reports of Dec. 16 and Dec. 12. • Marvellous Jupiter images (before the SEB revival) from Barbados! A lot is happening on the Sun, though not in white light: amateur dopplergrams from Dec. 6., more and more early Dec. pics, studies of a global eruption on Aug. 1 with "sympathetic flares" (more, more), the roles of the SDO and SORCE satellites in solar studies, a storm prediction that failed, ESA's helioviewer software, and the pulsating aurora. • Finally an AGU press conference reported preliminary results on city light pollution enhancing air pollution (more, more and more) - which led to a reaction from IDA in which the study leader isn't interested, though, as he said in Q&A. "Surely this must be one of the brightest and largest storms in the last few seasons," says Australian planet specialist A. Wesley about a huge white cloud that appeared on Saturn a few days ago: There are already quite a number of images showing it in the international Saturn galleries here, here and here; particularly impressive are this, this and this image. 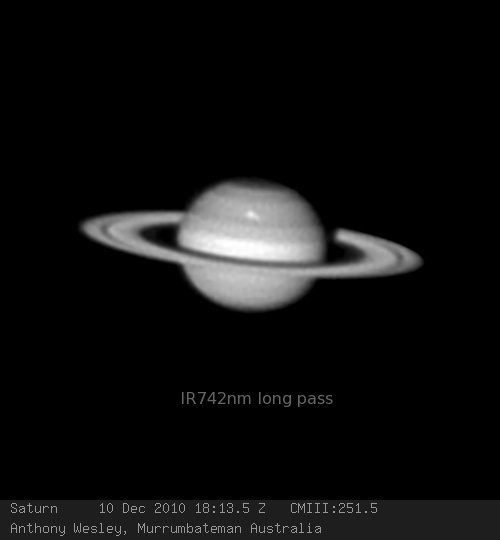 Saturn is approaching 44 Vir 3 times now, by the way, twice very closely. • The SEB revival on Jupiter continues, as again many pictures in this gallery document; there are also summary reports from Dec. 5 and Dec. 3 and some pics of Dec. 2. • A close-up of Venus from Dec. 10. • Some planetary constellations: Moon & Mercury on Dec. 8 (Oz) and Dec. 7 (US; detail), Moon crescent & Mars on Dec. 6 (very low & just after an occultation! ), Moon biting the Sun on Dec. 5 (but only for the SDO), the waning lunar crescent on Dec. 4, Mercury from a plane over India on Dec. 3 and Moon, Venus, Saturn & Spica on Dec. 2. Two major coming attractions are the total lunar eclipse on Dec. 21 (mehr, mehr) - and the Geminids on Dec. 13/14 (more, more, more and more previews): The activity profile is already picking up, we have a colorful spectrum - and there will be several rocket launches with the ECOMA particle detector to study the dust in situ; there is a campaign blog in German. • Lots of excitement in the U.K. over a bolide - that wasn't that bright at all (-5 to -7 mag. at max., I hear), just seen by many. • There may be better access to satellite fireball data for civilian researchers. • Studying an ancient impact with associated earthquake. • And a pretty weird paper linking an anecdotal story of alleged ball lightning in Oz in 2006 (one lonely witness, no physical traces!) to a fireball in the sky - which nonetheless many 'science media' picked up as something of importance, none worthy of linking here. 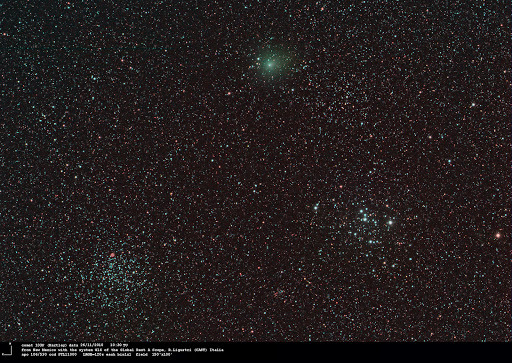 In other news comets 240P with a tail (also on Dec. 7), P/2010 U2 in front of M 33, P/2010 V1 on Dec. 7 and the development til now, and Hartley 2 on Dec. 7 and Nov. 27. • Also 15 years of SOHO comets, a paper on Holmes photometry with SMEI on Coriolis (alt.) and new details about a quasi-satellite of Venus. • A nice eruption on the Sun on Dec. 6 (image sequence also here -> hier -> here and stories here, here, here and here); the responsible filament also on Dec. 4 and Dec. 3. Plus a storm prediction, solar eruption studies and a paper about the January partial eclipse. • Amateurs helping Hubble with Cepheids, WW Cet, SMEI nova photometry and Eps Aur. • And night pictures from Antarctica. Dec. 1: Mercury in greatest Eastern elongation (21.5°). Dec. 2: Venus at greatest brilliance, reaching about -4.7 (sources differ between -4.5 and -4.9) mag. Dec. 7: Lunar crescent Moon near Mercury in the evening sky. Dec. 13-14: Peak of the Geminid meteors - apart from the Quadrantids next January the only major shower til 2012 without much lunar interference! Dec. 14: Mercury & Mars in conjunction, only 1° apart but very hard to observe at dusk. Dec. 21: Total lunar eclipse with partiality from 6:33 to 10:01 and totality from 7:41 to 8:53 UTC - this is bad for Europe (and even a bit late for the Eastern U.S.). See this 3-years-old entry for general - yet still seldom-heard - advice on how to get the most out of a total lunar eclipse! Dec. 27: Approximate beginning of a little morning visibility of Mercury. Dec. 29: The Moon forms an 8° triangle with Saturn and Spica in the mornings skies. Also of note are the arrival of Japan's Akatsuki in Venus orbit on Dec. 7 - and a particularly long interval between new and full Moon this month. We can also look forward to 2011 which starts right away with a partial solar eclipse on Jan. 4. The revival of Jupiter's SEB is continuing (following the typical scenario laid out 15 years ago in Sanchez-Lavega & Gomez, Icarus 121  1-17 almost exactly! ): progress reports up to Nov. 27 and Nov. 20, an animation, a map of Nov. 29 an amateur IR image of Nov. 17 and more reports (includig big scope IR imagery) from Nov. 29, Nov. 25, Nov. 24 (also on the IR pics; more, more, more, more, more and mehr) and Nov. 22 (mentioning this blog; more). The SEB disturbance is now so obvious that it can even be detected with poor seeing (Nov. 25). • On Venus a German amateur succeeded again in November to image the planet's surface in the NIR; also UV impressions of Nov. 27. Hartley 2 is still around: images of Dec. 1 & Nov. 27, Nov. 30, Nov. 27 (more, more), Nov. 26 and Nov. 23, plus a visual report of Nov. 30 and Herschel observations. • The origin of the Oort cloud (paper actually several months old), more thoughts about Pluto & Eris (diameters exactly the same?) and Sedna (at least as mysterious), a paper on triple Cleopatra, new NEO grants and Wisconsin (this spring) and South Africa (looong time ago) meteorite/crater stories. In other news symbiotic variable AX Per might erupt soon, and the status of Eps Aur (plus the 7th Newsletter of Citizen Sky). • A gorgeous picture of the zodiacal light from this location at an Indian observatory deep in the Himalayas; that took some preparations! • Extremely distorted lunar images from the ISS (as predicted; p. 7), a wild Halo display and an aurora movie. • The MyDarkSky project needs support. And hi-res lunar images by amateurs here as well as here!